I need to design a survey form which has 50 questions. There is a lot of branching depending on user's answer to question. For e.g. Q. What's your favourite fruit? 1. Apple 2. Orange If user selects Apple, subsequent questions should be related to Apple. And so on. What is the best way design this form from UI perspective? Zero indication that others receive a different experience. Make it invisible and seamless. Leave the user certain that their choice was the "right" choice. They should have no doubts about going back to change their answer. Kind of like when you go to a shop and the attendant believes in your choice. Like that. Use a wizard-like dialog as in many other (mostly Windows) application. There's no indication that the user will get diferent results varying on his selection. 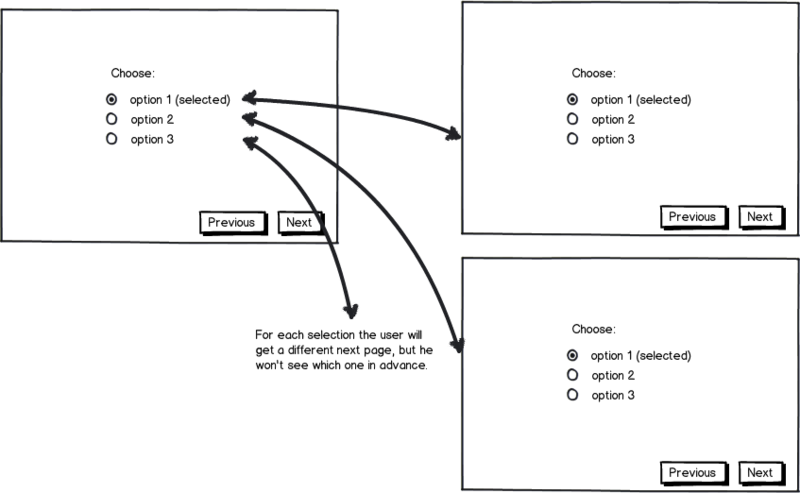 Otherwise, the user would not be able to make the selections independently, or would even try several options to see the difference. In the end, this would kill efficiency! The user chooses one option, clicks next and will see an individual page, optionally with an slide/fade animation. Hope it's clear and helps! Not the answer you're looking for? Browse other questions tagged forms surveys or ask your own question. What is the optimal layout for a form with two respondents?